"Life in the open air, in the sunshine, and a diet high in nutritional content coming from the produce of neighboring fields improve the physical health, while the calm surroundings, the silence, the wonders of nature satisfy the need of the mind for reflection and meditation." 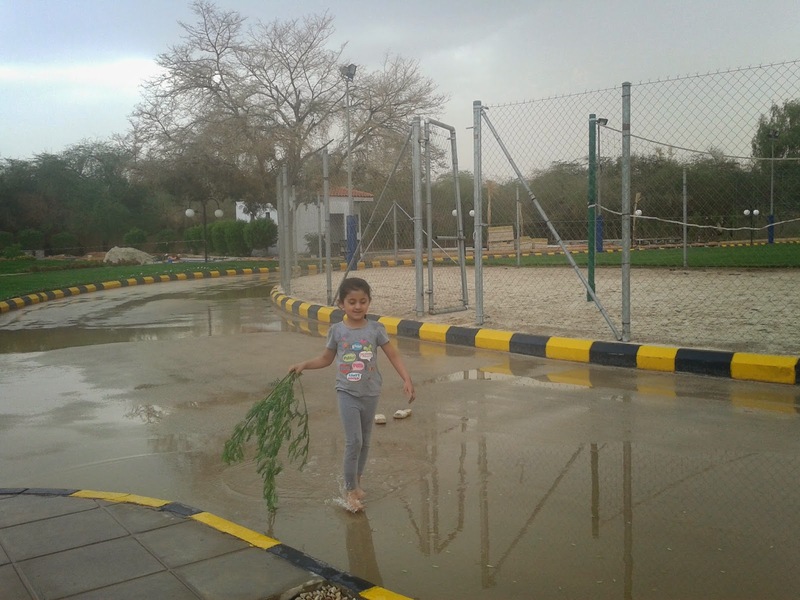 It was a lovely rainy day, when Nermeen jumped out to play with her favorite stuff. 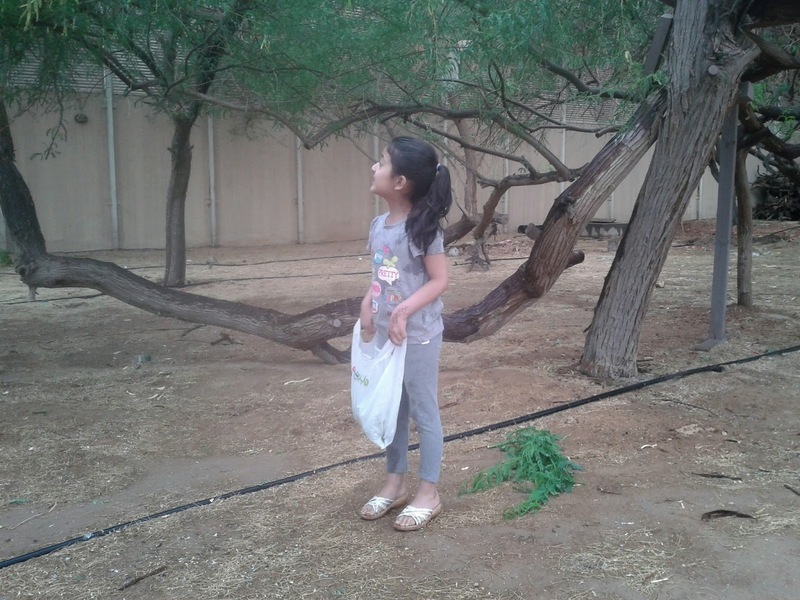 On her way to the beautiful backyard of her Residential Compound, she found few broken branches of trees. 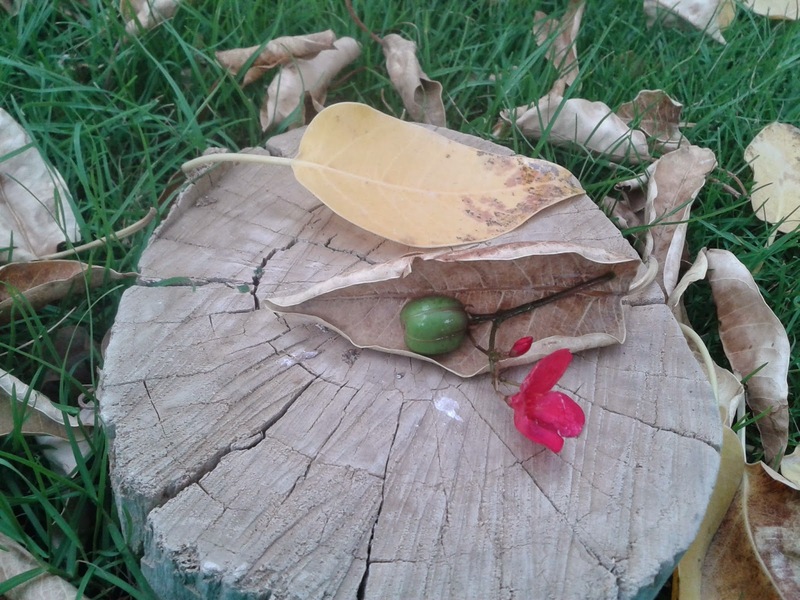 She asked me,"Oh look at it, it fell down from this tree". 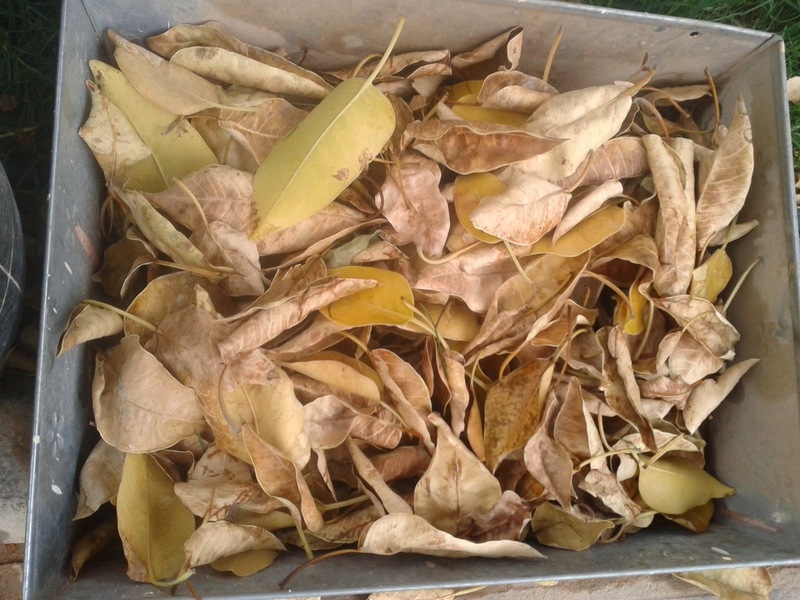 I replied," Why its been fallen down, I couldn't see anyone cutting them". She was thinking and wondering here and there ,"Wow ,what a windy day it is!.look at this tree, how the leaves are moving,wind is making them fall, I know that". I was not surprised by her answer because I truly believe that by interacting with NATURE, children learn everything by themselves. 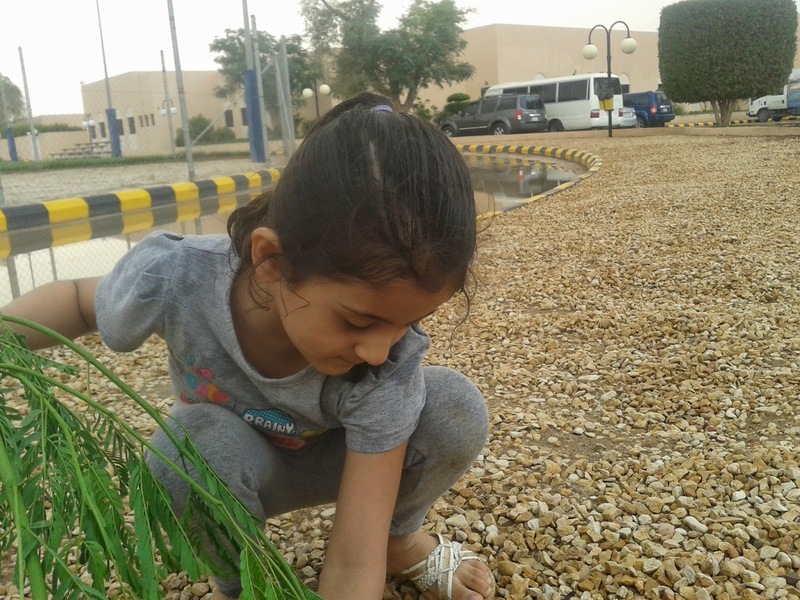 Nermeen ran to a field full of rocks and pebbles, she started collecting stones , feeling it in her fingertips, then at her palms. 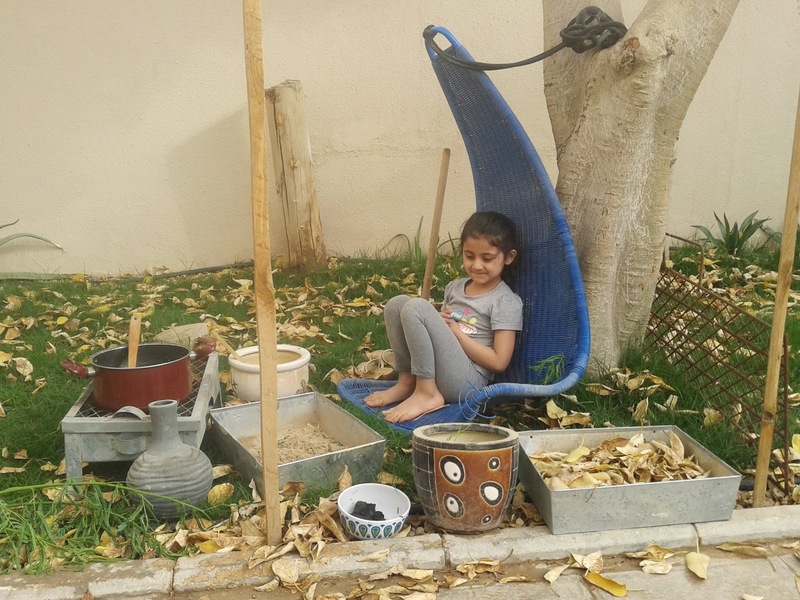 She shouted," I always like these tiny stones, I love to touch them, they are so cute". I saw Nermeen many times counting them, throwing them on the ground and sometimes in a pool of water. 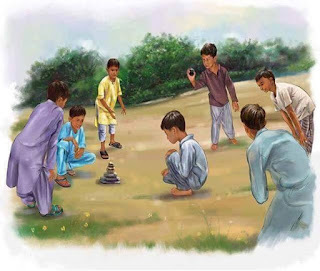 A child discovers the Law of Gravity when he throws a stone, his Senses get sharpened when he plays with different sizes, different colors, and different shapes of rocks. He discovers the amazing strength in a piece of rock as compared to a piece of leaf. He may discover the glorious effect on water when he throws in a pool. He discover the whole Landscape all by playing in Nature. "A child always moves ahead to a different activity when his soul finds satisfaction". This is what I observed in my years of dealing with children in all kinds of environments where Free-choice is given. So Nermeen went to the grassy field, hopping and dancing as she was enjoying every bit of this beautiful garden, she shouted," I love these Autumn leaves, and here I can see many". 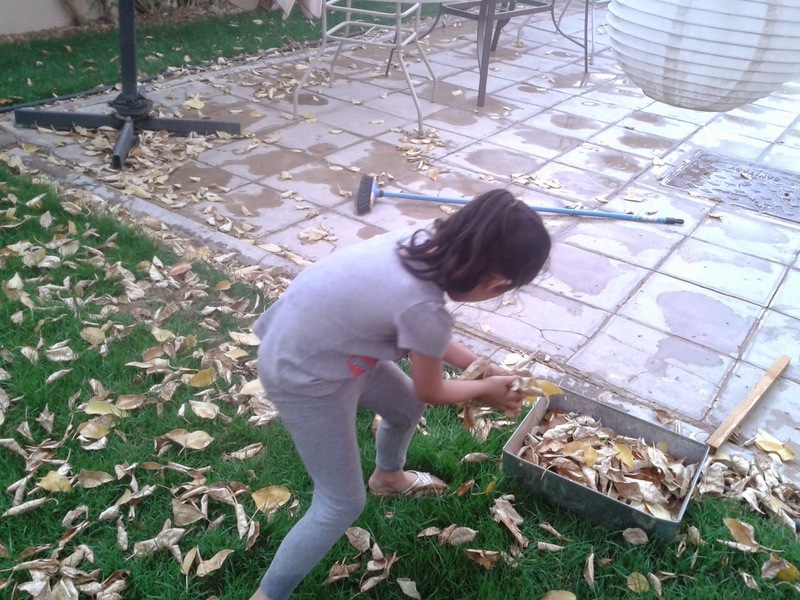 She started collecting the leaves." I can hear the sound of these leaves when I touch them, its different, I never hear this sound in a green leaf",she explained. 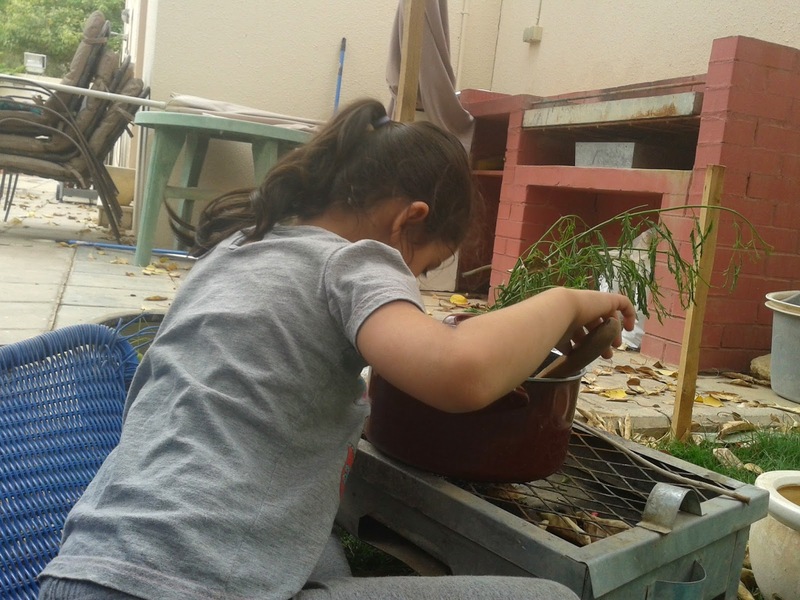 A child learns about the Seasons, weather, textures, and all about Botany when he plays in a Spring, winter, Summer or Autumn garden. 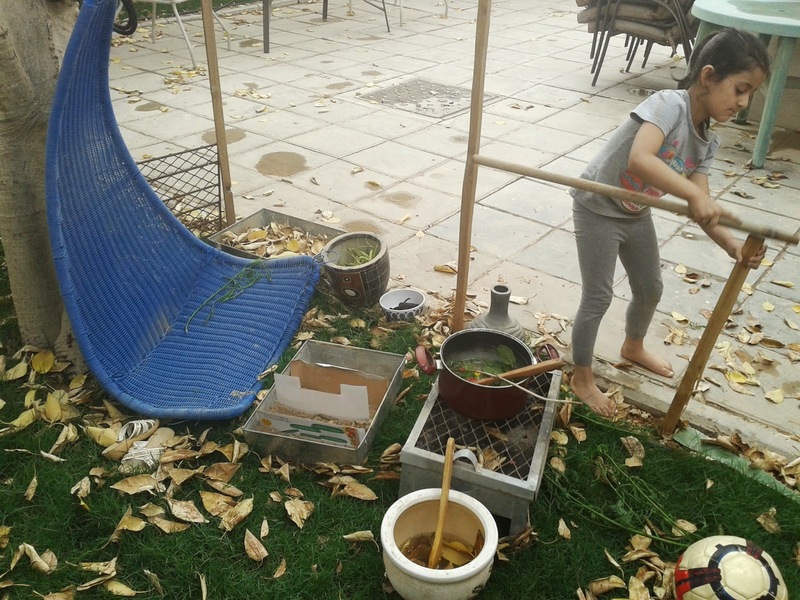 She ran to her favorite spot, Tree-House, but she told me that now she would only picked few leaves for her play without getting in the Tree house. 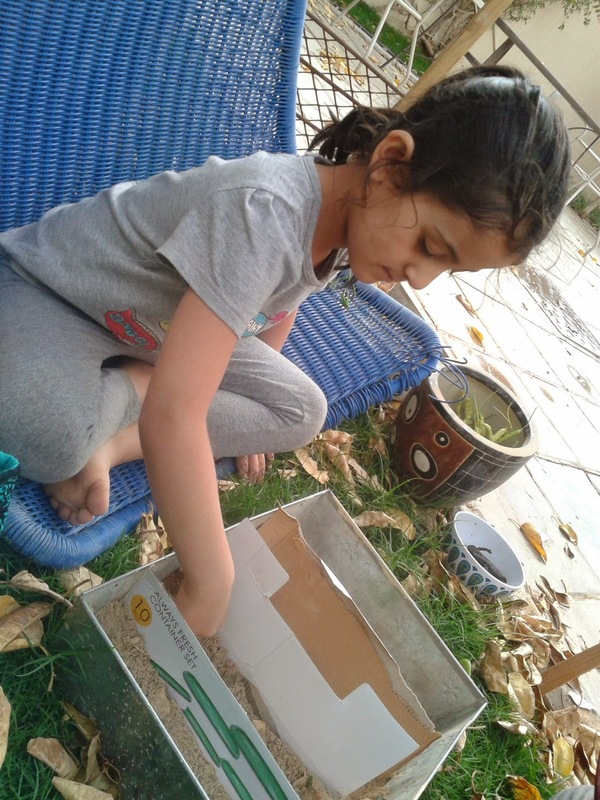 And Now we are back in our backyard, Nermeen filled many bags with dry leaves, green leaves, flower petals, rocks, and many other nature stuff. 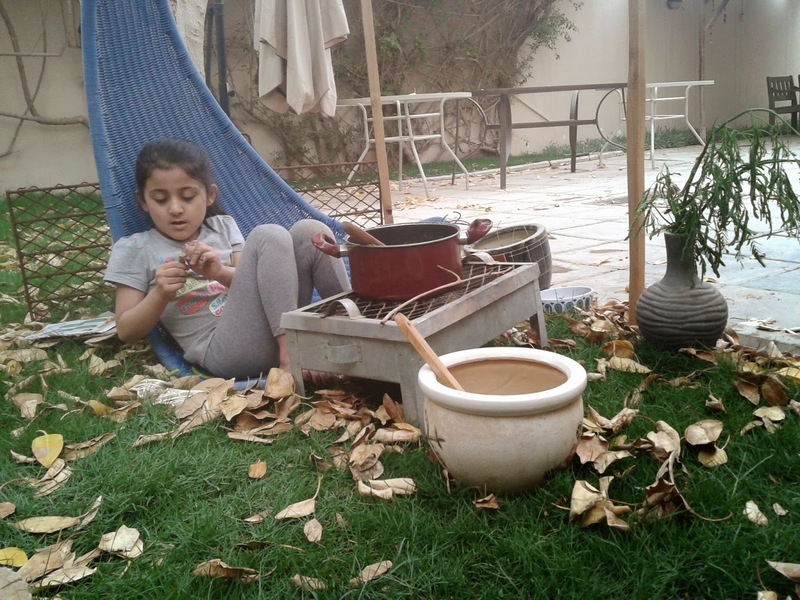 She started working in her beautiful MUD-PIE KITCHEN which she made sometime back last year. 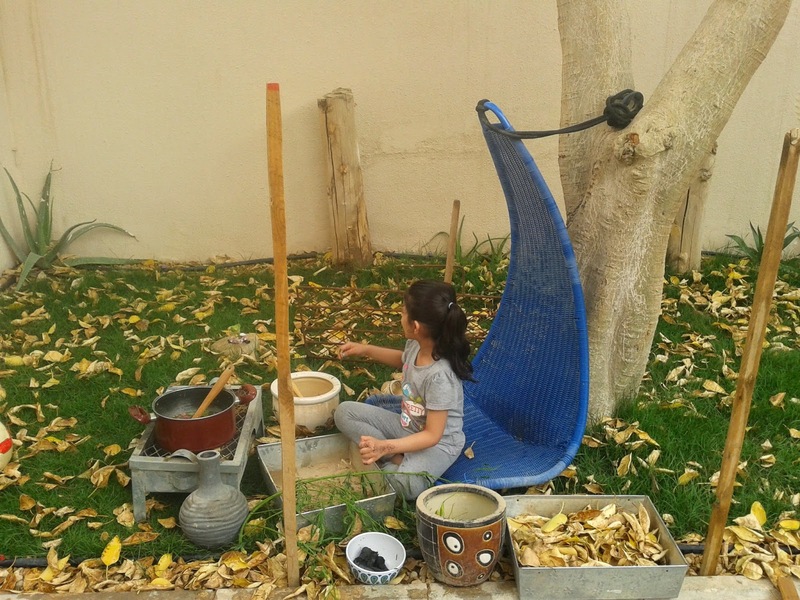 I love her Mud-Pie Kitchen which she made using amazing metalic stove, pots and pans which was just perfect for her play. 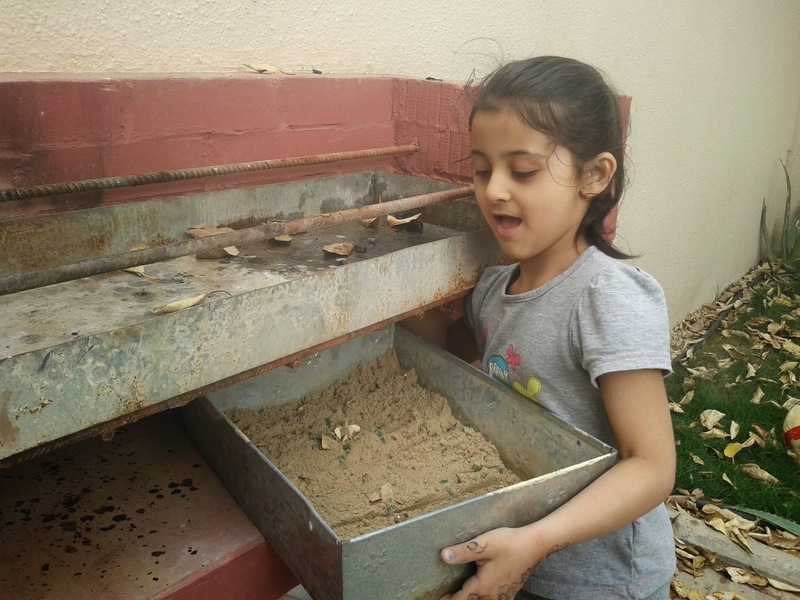 Every time Nermeen plays in her Mud-pie kitchen, she tries to add something, renovate , and change the infrastructure which is best suited for that particular day and play. 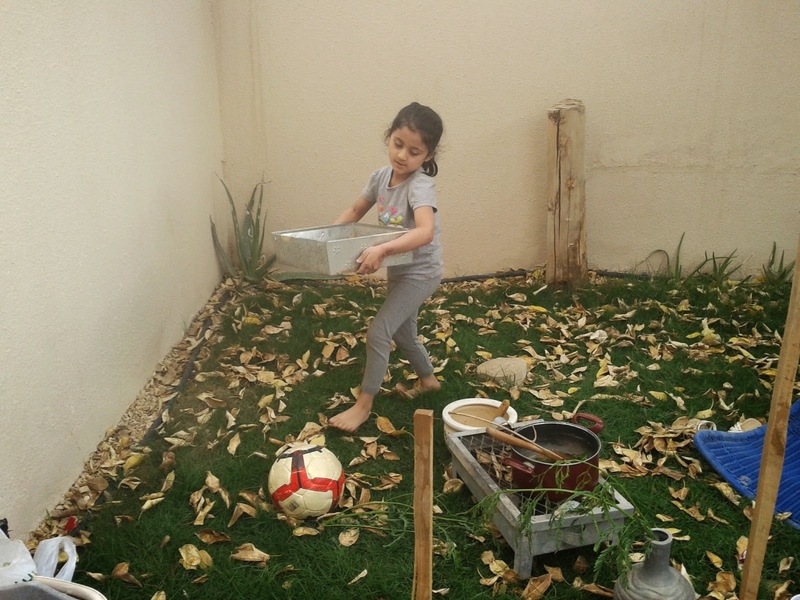 So on that day, she told me that she needed to construct a wooden fence because she loved the Play area her friend had in her backyard which had a beautiful fence, so no one could disturb them. "I am preparing a soup for dinner, would you like to have it later ?" She asked. "I would love to have it my dear".I replied. I saw her busy in her own Imaginative Play ,making everything for a perfect cooking. 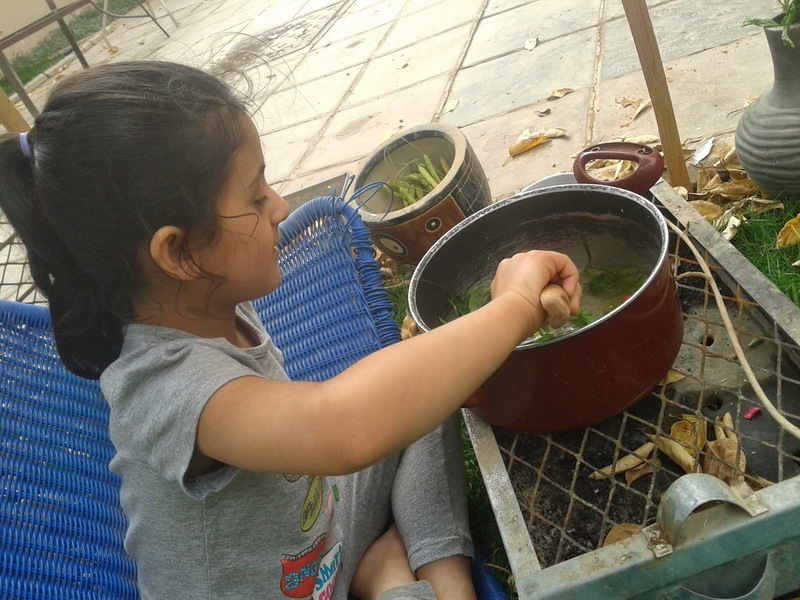 She was picking tiny leaves from that broken branch which she picked up from the garden and adding it in the colorful soup. 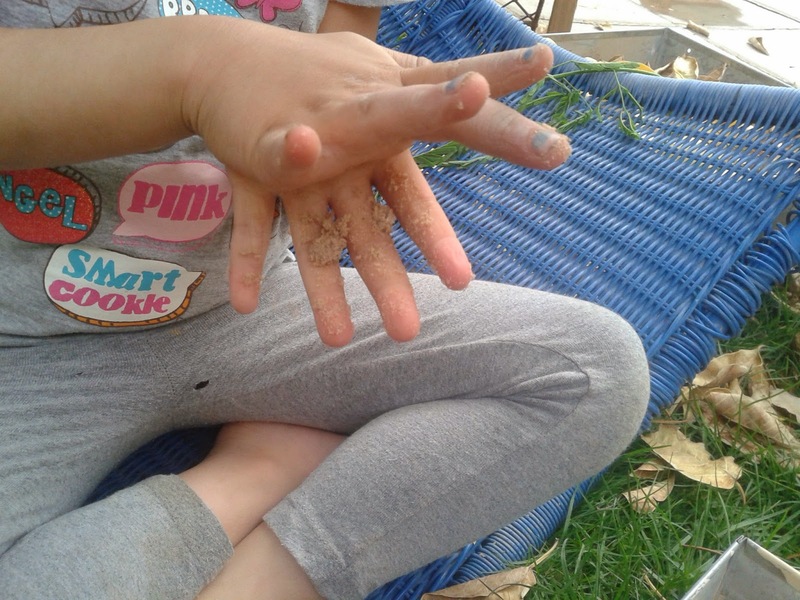 Fine-motor skills can be seen developing using her little fingers. She had enough of her Gross-motor development when she was carrying and running around. 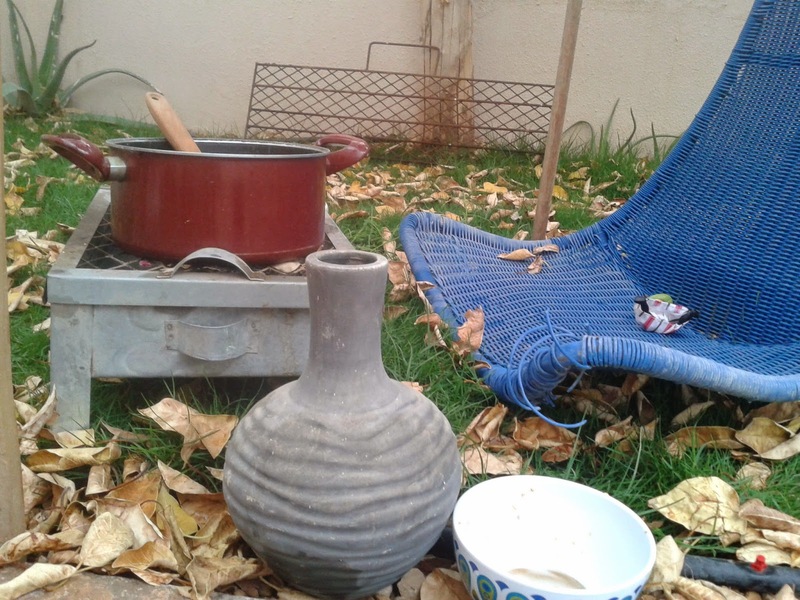 This was her beautiful play area in a perfect Autumn backyard. 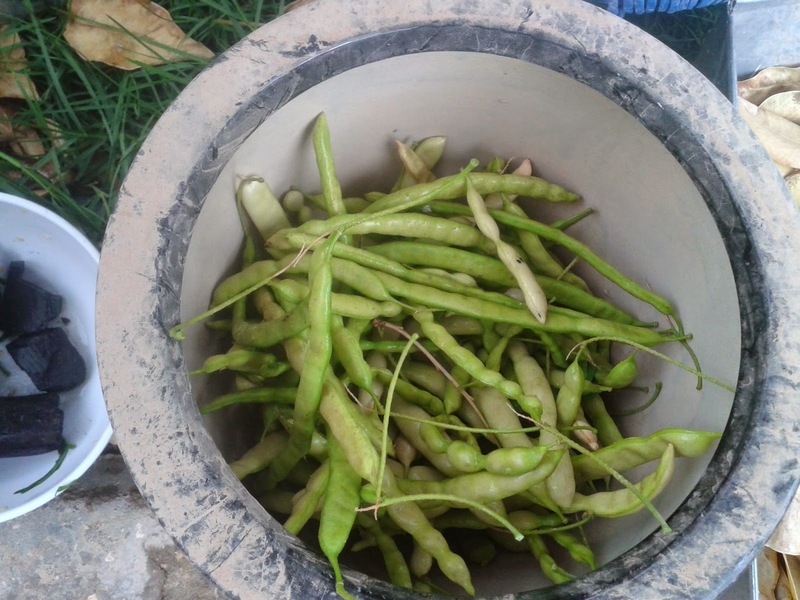 The beans which she collected from a nearby tree, she was using that for her Vegetable menu that night. 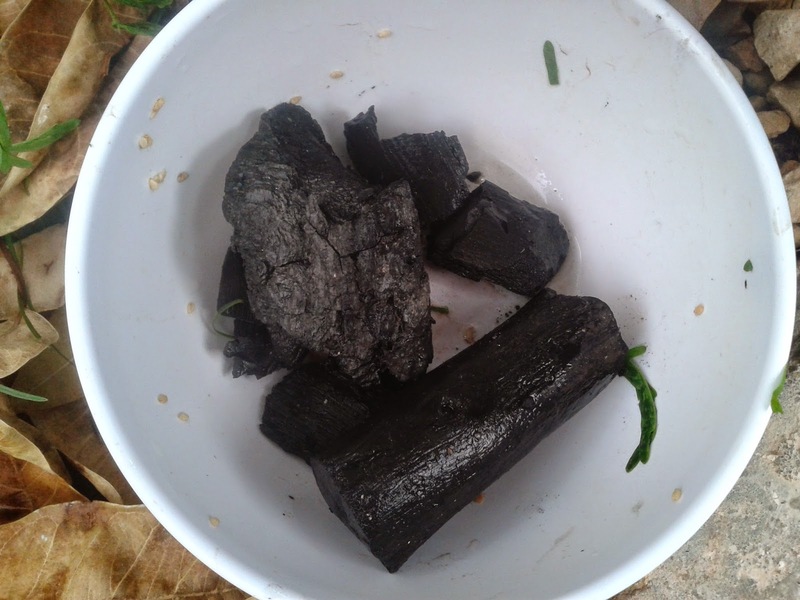 While coming back from the garden, she stopped at the Bar B Que area and got few coals for her stove. I saw her enjoying every single treasure which she collected; thinking different ways to play , preparing for the cooking.
" 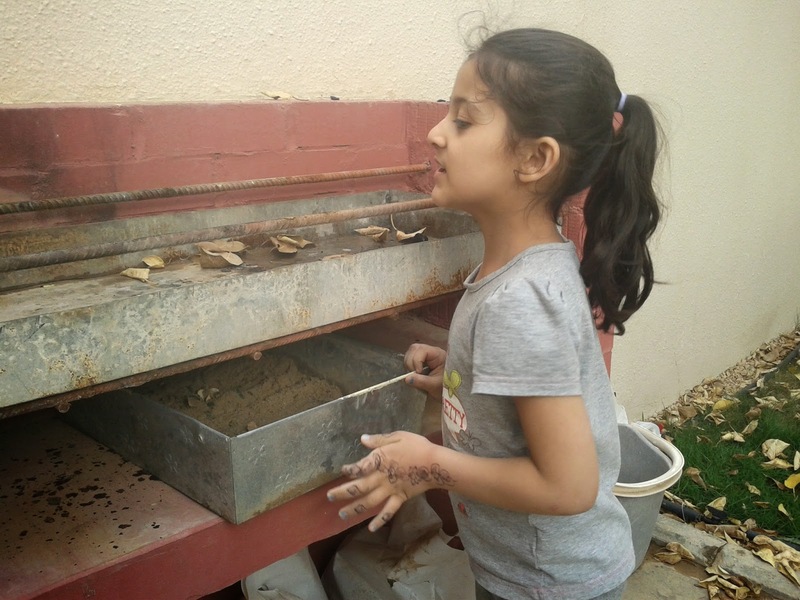 I like to bake too, I can bake a cake", she shouted, taking a steel tray in her hand and then filling it with the sand, leaves, petals and pebbles. "Hey, look at my oven, its there", she pointed to an old Bar B Que stand made of bricks and rods. I was just wondering how she estimated the Area for that tray to get in, but she found the perfect place for it. 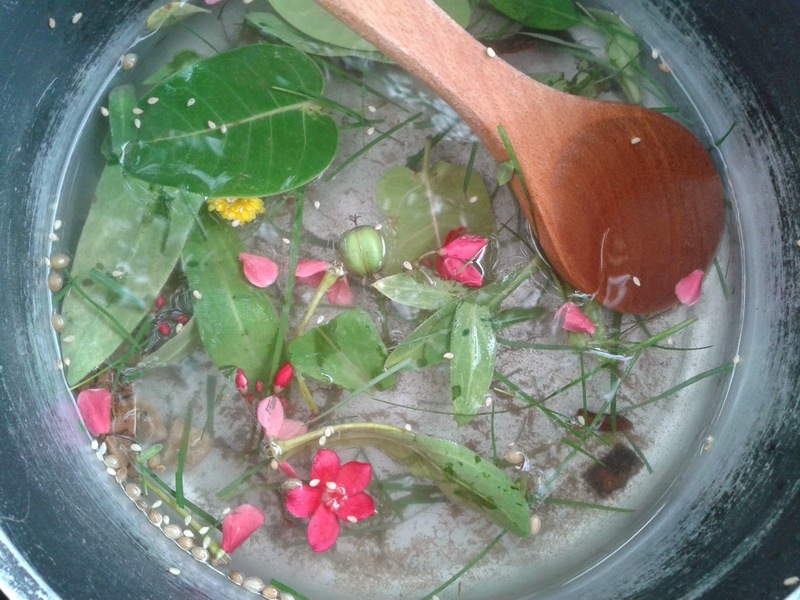 I could see a Log with some heavenly leaves, seed and flowers. Nermeen put it over there, I don't know whats in her mind when she put these Nature stuff on that log...........can you figure it out. 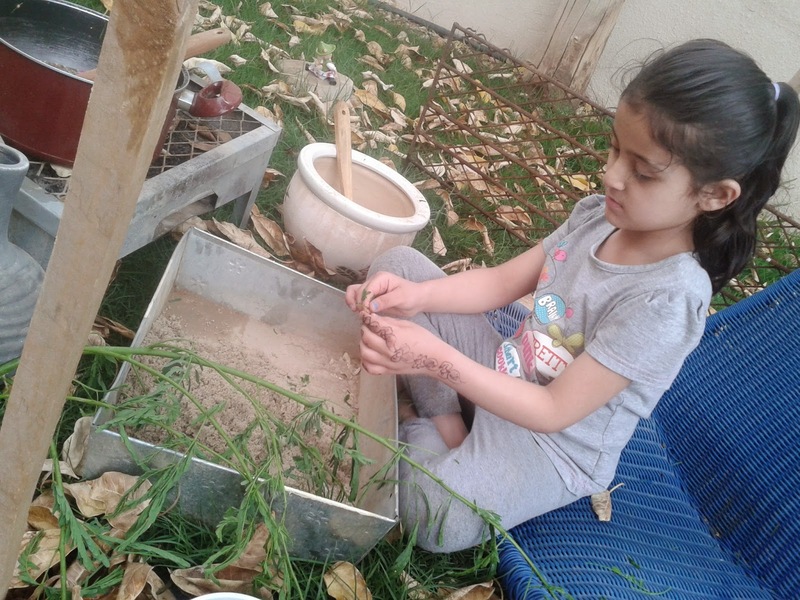 Busy in her cooking; Pretend-play is one kind of an Imaginative play which prepares a child for the real situations without getting the trouble of loosing anything but to gain the control on his environment all unknowingly without any teacher to instruct. She tried every single moves to prepare food ; she was cuddling her palms as if making Kebabs. She must have watched her mom or someone doing this in the kitchen. This is the POWER OF OBSERVATION. 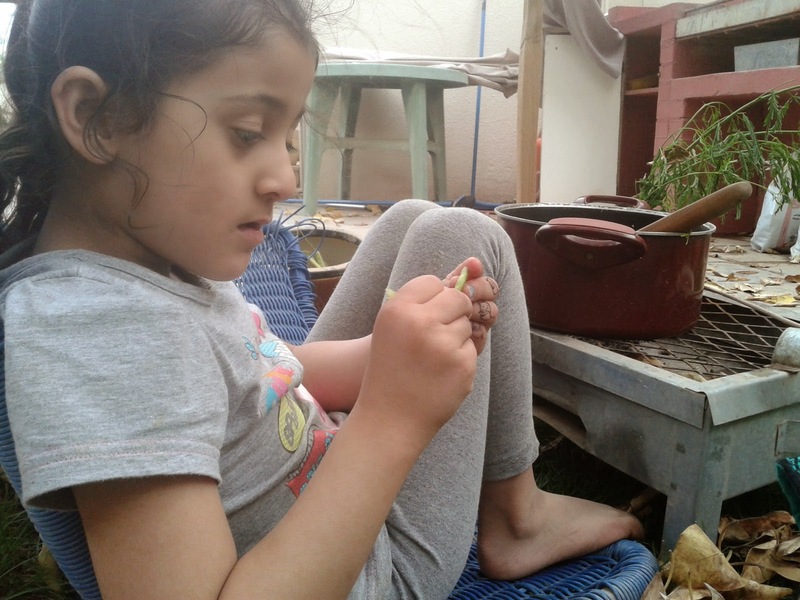 While she was busy in her cooking, she discovered the beans, how it could be opened , how delicately it can be handled and how perfectly we needed to work with it. 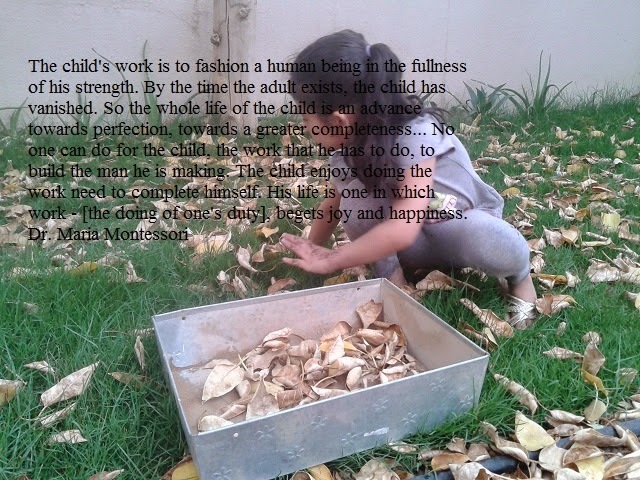 I never saw Nermeen feeling tired, she is always busy in her PLAY and we call it WORK as Maria Montessori pointed out," PLAY IS THE WORK OF A CHILD". "... Does Nature make a difference work and play or occupation and rest? Watch the unending activity of the flowing stream or the growing tree. See the breakers of the ocean, the unceasing movements of the earth, the planets, the sun and the stars. All creation is life, movement, work. What about our hearts, our lungs, our bloodstream which work continuously from birth till death? Have they asked for some rest? Not even during sleep are they inactive. What about our mind which works without intermission while we are awake or asleep?"